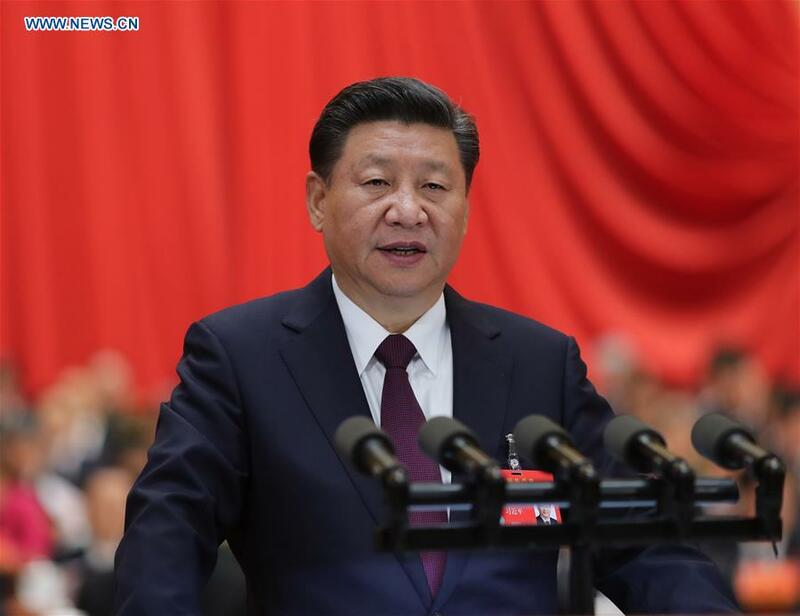 BEIJING, Oct. 19 (Xinhua) -- Chinese President Xi Jinping's report at a landmark meeting of the Communist Party of China (CPC) has further boosted the confidence of foreign countries and organizations in China's development prospect and global role. In the report delivered Wednesday at the opening session of the 19th CPC National Congress, Xi, who is also general secretary of the CPC Central Committee, blueprinted China's future development and reiterated Beijing's aspiration to build a community with a shared future for mankind. The report "outlines China's grand strategy for the next few decades" as it brings greater clarity to the vision for China's full modernization by the middle of the 21th century, said Dali L. Yang, a professor of political science in the University of Chicago. In particular, the expert said he was impressed by the report's emphasis on the environment and efforts to build a greener China. "In fact, the report mentions the environment more than the economy. Modernization is more than economic growth and Xi's report is a clear articulation of the CPC's greater emphasis on balanced development," he told Xinhua via email. B. R. Deepak, a professor at the Center of Chinese and Southeast Asian Studies of Jawaharlal Nehru University in New Delhi, noted that Xi's report draws a blueprint for China's future direction. "With this blueprint, China will forge ahead to transform into a great modern socialist country by 2050," added the renowned Indian expert on China. He added that China's vision of building a community with a shared future for all humankind, championed by Xi, emphasizes the ongoing trend of multi-polarism, interdependence, tolerance and mutually-beneficial cooperation. Noting that Xi mentioned the Belt and Road Initiative in his report, Deepak said, "In the next five years, we will witness a lot more infrastructure connectivity in Eurasia, and the region is likely to emerge as an important driver of regional and global growth." For Rashed Khan Menon, Bangladesh's civil aviation and tourism minister, China's progress is very important to developing countries like Bangladesh, and Xi's speech reflects what people desire across the world. "I do believe that the CPC led by Xi Jinping is capable enough to build a modernized socialist China with Chinese characteristics," he said. "We are confident in his leadership dynamism to lead China forward." In the eyes of Suresh Acharya, a senior member of Nepal's Rashtriya Prajatantra Party (Democratic), Xi's report is "highly important for the entire South Asia and neighboring countries like Nepal." "From his remarks I see very positive signals to materialize the dream of creating this century as the Asian Century," he said. "The pragmatic vision presented by President Xi will help to build a peaceful and harmonious world." "I believe that China will become a global leader as envisioned by President Xi in terms of comprehensive national strength and international influence," he added. "Common prosperity for everyone will be basically achieved."